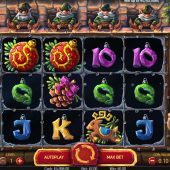 Jingle Spin slot is this year's annual Christmas game from NetEnt who consistently and reliably churn one out for the festive season. The downside of this is that on most occasions it's nothing new, a re-skin of an existing game like Flowers - Christmas Edition was and also Fruit Shop got the same treatment. We even had the classic Secret of the Stones reskinned as Secrets of Christmas so there's no expense spared from this developer during the season of goodwill. Here we have an inane theme with dwarves squatting above each reel and the grid over a stone fireplace with of course gentle Christmas music playing while we spin. If this wasn't enough, I soon spotted the sinister secret the Boss Dwarf is hiding by the right of the reels which as you will discover means Scrooge is definitely alive and kicking at NetEnt HQ, so beware your bankroll! When typing this Jingle Spin slot review please bear in mind I am trying to delay the penny being dropped for as long as possible - well, I'll try my best anyway. We have 20 paying lines over 5 reels of 3 rows each and single icons. 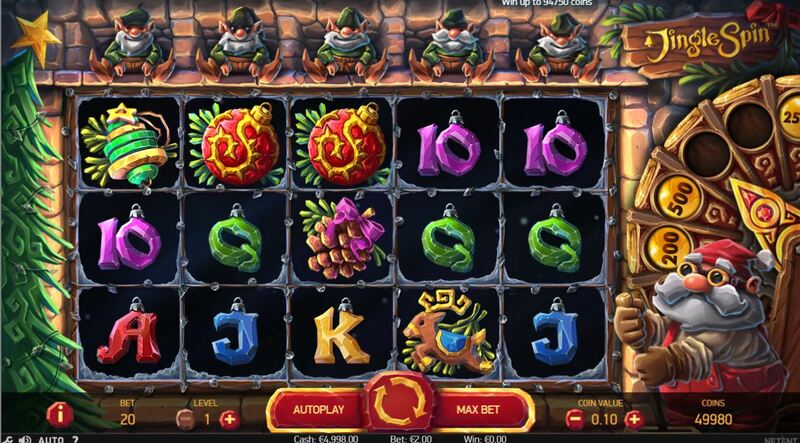 Our line pays for 5-of-a-kinds are quite good with the Present Wild or Red Bauble paying 50x your stake, Orange Slice 35x, Green Bauble 25x, Reindeer Decoration 20x and Pine Cone 15x and five card values of between 2.5 and 4x bet for the full line. There are no scatters on the reels but now alas we must meet the boss Santa Dwarf on the right of the reels. So Santa Dwarf is pulling his lever which operates a wheel containing various Baubles or blanks. Should his pointer end up landing on a wheel position containing a Bauble then it is deposited with the dwarf above reel 5 and then passed along to the left via the other 4 dwarves one spin at a time until disappearing off the first reel. It may however be dropped down for you and award its prize but only if a Wild lands on the reel the Bauble is being held over. The baubles can be yellow and have a coin prize of between 2 and 125x bet, be green and contain 7, 10, 12 etc. up to a maximum of 50 free spins or be red and contain an expanding block Wild which can be up to 3x3 depending on where it drops. There is a multicolored one too which can contain any one of the aforementioned prizes. In the event of free spins the Santa Dwarf will begin to work his lever very hard and ensure there's always a Bauble above every reel for the duration of the spins, including the green free spins ones for retriggers. This means that every Wild Present landing on the reels will award a prize unless it was already won on another reel and is now blank. Yes, I can't hide your Netent Christmas gift any longer - of course you're really playing.....drum roll......EGG-O-MATIC! Jingle Spin slot simply reminds me of the hopelessness that Christmas unfortunately brings to some; maybe, just maybe, this year gran won't leave you that 3-pack of unfashionable stripey socks under the tree like she has since you can remember. You know in your heart though what you'll inevitably get and that's your NetEnt Christmas slot each year, the same old thing in different wrapping. It's not that Egg-o-matic is a bad game, far from it and I can understand a developer not wanting to invest much in a seasonal slot but sometimes they would do well to remember that if they make a good job of it that it would be played all year round like Microgaming's classic Deck The Halls is.